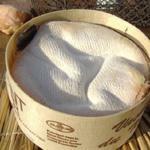 Wrap the bottom and sides of the vacherin (still in it’s box) in kitchen foil. Pierce the cheese and insert the garlic cloves. Pour over some white wine. Place in the oven uncovered for 20-25 minutes at 200C. To serve remove the top crust and serve in its box. Accompany with cornichons, boiled potatoes and sliced saucisson. Preheat the oven to 160C/gas 3. Score the skin of the belly with a sharp knife and season with salt and pepper. Arrange the parsnips on the base of an oven proof dish and place the pork on top. Roast for three hours until the juices run clear when the meat is pierced with a skewer and the crackling is golden-brown. Remove the meat from the oven, cover with aluminium foil and leave to rest in a warm place for 10 minutes. For the sauce: Heat the butter in a pan, add the chopped apples and cook until softened. Add a splash of chicken stock and cook until the sauce has reduced slightly and has thickened. Carve the joint into thick slices. 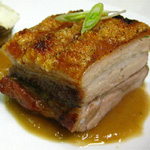 Serve the sauce with the roasted pork belly and parsnips. Use 1.25ltr of water for 250g polenta flour. Boil the water and add some salt. Then begin pouring the flour into the water, while whisking to avoid lumps. Once the mixture starts to bubble, swap the whisk for a wooden spoon and keep stirring. Cook for 50-60 minutes stirring very often, trying to make a circular motion scraping the sides and bottom of the pot. While the polenta is cooking, prepare the grouse for the oven. Preheat the oven to gas mark 8 (240C). 20 minutes before the polenta is ready, rub the grouse with 100g softened butter and season with salt and pepper. Place in a tray and roast for around 12 to 15 minutes. Make sure they are still nice and pink, then remove from the oven and leave to rest. Heat a frying pan with the rest of the butter and sautee the mixed mushrooms gently for a few minutes. Season with salt and pepper, gently turning wtih a spoon. Add the parsley and remove from the heat. The polenta will be ready when a crust forms on the edges of the pot and when shaking the pot, the polenta detatches by itself from the crust. At this point you can add the cheese in small pieces. Turn the pot upside down quickly on a wooden dish for best presentation. Remove the legs from the grouse with a sharp knife, then the breasts and slice. 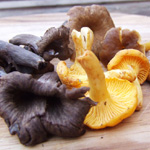 Place the mushrooms and grouse on the plate and serve with the hot polenta. Slice the onion very thinly and gently fry in a little olive oil until soft. Allow to completely cool down. Prepare the dough: melt the yeast with the sugar in 100ml of lukewarm water, mixing gently. Leave for a few minutes until a light foam appears on the surface. 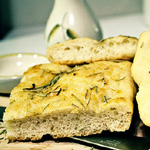 Knead the sifted flour with the remaining water, yeast mixture, salt and chopped rosemary for 15-20 minutes until the dough is elastic but still sticky. Place in a bowl to rest for at least 2 hours, covered with a tea towel, at a temperature of around 24*C. Make sure there isn’t any draft around the dough, or it will not rise properly. Grease an ovenproof dish with oil, then mix the remaining oil with the same amount of water. Work the dough on the dish, then pour the oil/water mixture over it, sprinkle the onions and push them lightly inside the dough making small holes. Leave to rest for another hour. Sprinkle with fleur de sel, and cook in a very hot oven (the maximum temperature your oven allows) for 15-20 minutes. Never open the oven while cooking! Mel - good point! I'll remember that next time.Carrie - yah, I tuhgoht of that after the fact. :(SO - Exactly! All is well.Bill - Yep! there truly is an "official" nameICanHuntToo - glad to have you! THanks for the comment and reading my blog. If you practice the "farmer blow" you will get the hang of it. I'll admit that I'll only use this new found trick of mine only out of necessity. If there are tissues handy - that will be used first!